The Tri-dra Mouse is a breed of mouse found in the Whisker Woods Rift. Tri-dra mice have been found to be especially attracted to String Cheese, to the point that any other kind of cheese will simply not suffice. Tri-dra mice are weak to Rift Traps. They can only be attracted by String Cheese, and only after reaching 50 rage in the Deep Lagoon. Catching a Tri-dra will reset the rage levels of all three factions in the Whisker Woods Rift unless a Taunting Charm is armed. The Tri-dra Mouse drops the Enlarged Rift Egg during the annual Spring Egg Hunt. Tri-dra mice were introduced on 28 January 2015, with the introduction of the Whisker Woods Rift. 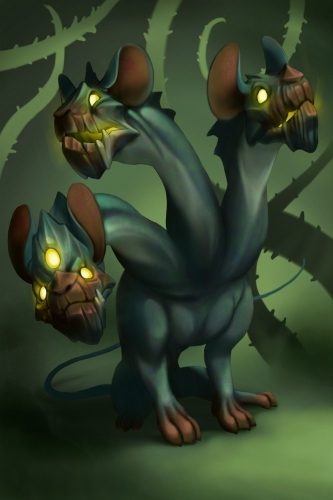 Tri-dra mice are the Rift version of Hydra mice. This page was last edited on 27 May 2017, at 03:28.